The 28th of April marks 30 years since Aloha Airlines flight 243 had its hull ripped open at 24,000 feet. In light of the current focus on metal fatigue and the proper maintenance of aircraft, I thought it would be interesting to look at the accident in 1988 which changed the way we looked at both metal fatigue and maintenance timing. 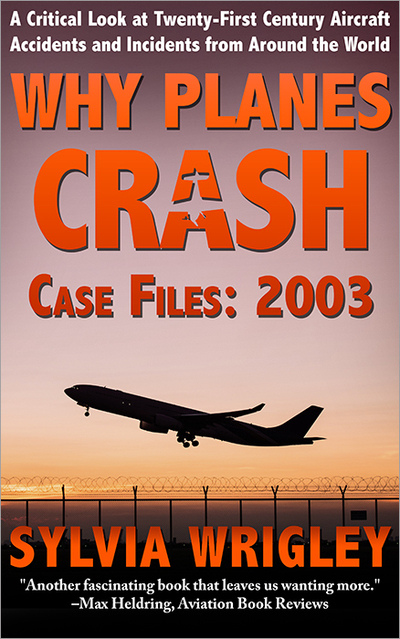 We often talk about how incidents and accidents change aviation. 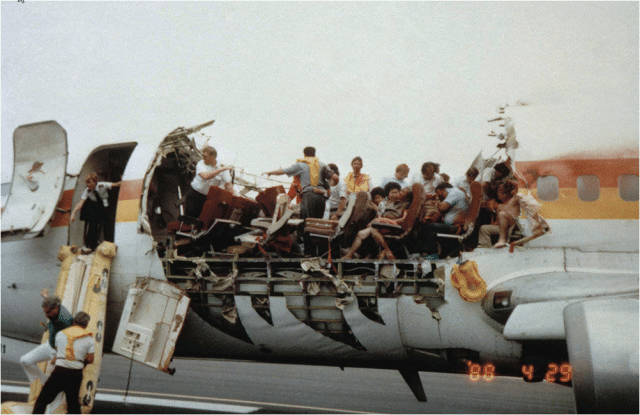 I suspect that Aloha Airlines flight 243 was quite possibly the biggest game-changer for aviation maintenance procedures and regulation… but feel free to tell me about other ones in the comments! On the 28th of April 1988, Aloha Airlines flight 243 was a scheduled flight from Hilo International Airport to Honolulu International Airport. The accident aircraft was a nineteen-year-old Boeing 737, part of Aloha Airlines 737 fleet for inter-island flights (ferrying passengers around Hawaii). That morning, the flight crew had arrived at the airport at Honolulu around 5am. The first officer did the external pre-flight inspection and was satisfied that the aircraft was ready for flight. The accident report says that the crew flew six flights, which it describes as ‘three roundtrip flights from Honolulu to Hilo, Maui, and Kauai’ which sounds to me like each ‘roundtrip’ must have been four take-off and landings. At 11:00, a scheduled first officer change took place. The crew flew from Honolulu to Maui and then from Maui to Hilo…Neither pilot left the airplane on arrival in Hilo, and the crew did not perform any visual exterior inspection nor were they required to. However it shakes up, the point here is that the Boeing 737 was making a lot of short hops, as was typical of all the aircraft in Aloha Airlines Boeing 737 fleet. At 13:25, the flight departed Hilo for the last leg of the roundtrip, back to Honolulu. There were 95 souls on board: two flight crew, three flight attendents, an FAA air traffic controller in the cockpit’s observer seat and 89 passengers. The weather was clear and the departure was uneventful. As the Boeing 737 reached its cruising altitude of 24,000 feet, a piece of the fuselage tore open. In the cockpit, there was a loud clap or whooshing noise, followed by the sound of wind. The first officer’s head was jerked backwards and she found herself staring at debris floating around the cockpit. The captain looked back and realised he could see straight into the cabin, the cockpit door was gone, and there was blue sky where the first-class ceiling should be. The aircraft rolled to the left and then to the right as the pilots and the controller put on their oxygen masks. The captain took control and initiated an immediate descent. The cabin crew were standing at their positions along the aircraft while the passengers were still seated with the seat-belt sign illuminated. The cabin crew member at the front of the aircraft was swept out of the cabin through the hole on the left side of the fuselage. The other two cabin crew were thrown to the floor, one striking her head hard as she fell. The other managed to crawl up and down the aisle to assist and calm the passengers. The first officer set the transponder to 7700, signalling an emergency, and attempted to contact Air Traffic Control. The flight crew could not hear each other and had to use hand signals to communicate. They also had no idea if their attempts to use the radio were successful. As it happens, the controller did not receive the blind communication but noticed the emergency code on the transponder return. At the aircraft descended to 14,000 feet, the first officer changed frequency to Maui tower and again broadcast blindly that they’d had a rapid decompression and were declaring an emergency. This time, the message got through and Maui Tower prepared for an emergency landing with rescue vehicles along the left side of the runway. In 1988, the control tower had to dial the emergency number 911 in order to get ambulance services, same as anybody else. But the controller didn’t realise that medical help would be needed. The flight crew stated their emergency as a rapid decompression which, while true, didn’t give Air Traffic Control any real understanding of the state of the Boeing 737. The captain began slowing the aircraft as he reached 10,000 feet above mean sea level. He retracted the speedbrakes and removed his oxygen mask as he turned towards Maui’s runway 02. The noise level dropped and the flight crew were able to hear each other and the radio. The captain experimented with the flaps extension and speed to work out the best parameters for controlling the aircraft, deciding on flaps 5 and indicated airspeed of 170 knots. As if this wasn’t enough, as the captain was manoeuvring for the approach, the aircraft yawed: the left engine had failed. The Boeing 737 was shaking and rocking. Despite all of this, at 13:58, 35 minutes after take off, Aloha Airlines flight 243 landed safely on Runway 02 at Kahului Airport on Maui. Unbelieveably, there was only one fatality, the cabin crew member who is listed on the report simply as “lost in flight”. If that isn’t a miracle, I don’t know what is. I can only imagine the horror of the aircraft coming into sight and the relief as it touched down. However, the rest of the passengers and crew needed medical attention. Somehow, the first ambulance didn’t get notified until about the time of touchdown and it didn’t arrive at the scene until seven minutes later. Even if someone had called 911 from the very first, there was another problem – the island only had a couple of ambulances which were nothing like enough to deal with a Boeing 737 full of traumatised people. ATC ended up phoning a Hawaiian tour company and asking for as many of their 15-passenger vans as they could spare. Two of the tour company drivers had experience as medics, so they created a station on the runway to treat and move the injured, while office staff and airport mechanics drove the vans the three miles to the hospital. There were only eight serious injuries, one cabin crew member and seven passengers, and as far as I can see, all of them recovered. 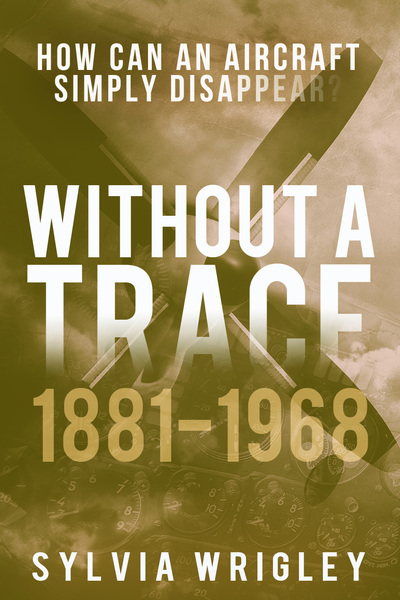 Obviously, it took some time to understand what had caused the damage, especially since the missing fuselage of the aircraft was never found, so the investigation was left to try to recreate what happened without physical evidence of the initial damage. The pilots had not seen anything wrong with the plane but, surprisingly, a passenger had. As she was boarding the plane at Hilo, she’d noticed a crack in the fuselage. She didn’t mention this to ground personnel or flight crew; she couldn’t have known that she was the only one to see it. But there was no exterior inspection at Hilo: the flight crew had never left the cockpit. The crack that she described was in the upper row of rivets along the S-10L lap joint, about halfway between the cabin door and the edge of the jet bridge hood. A lap joint is where two or more pieces of material are overlayed and joined together. An aircraft fuselage is designed from sheets of metal which are overlapped and then held together with rivets; the line of rivets that you can see on the exterior are the lap joints. These rivetted ‘seams’ are the lap joints and they are known to be a structural weak point when it comes to pressurised aircraft. In 2004, there was a media exposé of this ‘big new problem for Boeing’ and the issue hit the news asgain in 2013 when Southwest Flight 812 lost a panel at 34,000 feet but actually, this was nothing new: the aviation industry actually became devastatingly aware of the problem in 1998 when it became clear how this had happened to Aloha Airlines flight 243. Now industry practices and testing means that there are rare cases which might slip through the net. At Aloha Airlines in 1988, it became clear that it was simply a matter of time until the first fuselage ripped open. The Boeing 737 was designed for a service life of 20 years with 51,000 flight hours and 75,000 cycles. According to Boeing’s ‘fail-safe design’, the fuselage could suffer a 40-inch crack without suffering catastrophic failure. 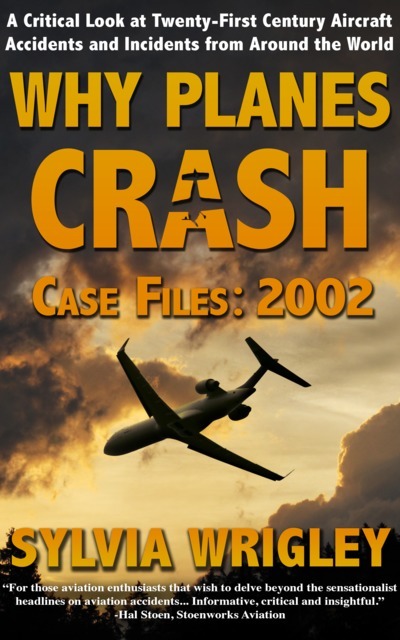 This was based on damage to the skin from external damage, such as projectiles from an uncontained engine failure – exactly the scenario of Southwest Airlines Flight 1380, the Boeing 737-700 in which the debris from the engine, effectively shrapnel, caused a rapid decompression in the cabin. A key point in this case, however, is that the window was the point of failure, not the fuselage. The fuselage design includes ‘tear straps’ running around the fuselage skin (both longitudinal and circumferential) which redirect running cracks from external damage to a new direction, perpendicular to the crack. This redirections cause the fuselage skin to ‘flap open’ and release the internal pressure in a controlled manner. In 1967, Boeing determined that the fuselage would withstand damage up to a 40-inch crack but that was of course with a ‘normal’ aircraft taking sudden damage. Boeing used ‘guillotine tests’ to demonstrate how the fuselage would fail safely: two side-by-side 15-inch blades penetrated the fuselage which produced an instant separation of the skin. The separation redirected itself as circumferentially, produced a flap and resulted in a controlled decompression, exactly as planned. However at the time, the cumulative effect of adjacent cracks developing over time were not properly understood, and the result was completely different than the sudden sharp impact of a projectile. The redirection of a fuselage crack depends on the integrity of the structure ahead of the track tip. On the accident flight, the skin tore but the area around it didn’t ‘stiffen’ as expected because it was also subject to cracks and deformed rivets. Under the stress of the initial tear, the tiny fatigue cracks linked up. Instead of a controlled loss of pressure, the aircraft suffered an explosive decompression as the hull was ripped off. That’s not to say that there were no concerns with aging aircraft at the time. Boeing had established an Aging Fleet Program specifically to keep an eye on the changes of aircraft as they reached the end of their design life and to support operators in maintenance and repairs to keep their older aircraft safe. Lap joints showing fatigue cracking was initially reported in 1984, four years before the accident. In retrospect, it’s not surprising that this was first reported by Aloha Airlines. Aloha Airlines was a part of Boeing’s Aging Fleet Program and was visited by the Boeing team for inspection of their highest flight/cycle time aircraft. N73713, the accident aircraft, was one of those surveyed. At the time, it was 19 years old and had 35,496 flight hours and 89,690 cycles, which was the second highest number of cycles in the worldwide Boeing 737 fleet. Now to be fair, Boeing personnel reported concern about the corrosion and skin patches they’d found on that aircraft specifically and on at least one other. They recommended that Aloha take their current 737 fleet, several of which had exceeded 75% of the 737’s design life, and totally strip and upgrade the structures, which would mean the aircraft being out of service for a month or two. Aloha Airlines hired a bunch of new staff to deal with keeping their fleet safe, including a Staff Vice President of Quality Assurance and Engineering, a Director of Quality Assurance and a Chief Inspector. But what they didn’t do was prioritise stripping and upgrading the 737s as a matter of urgency. After all, their 737’s flew short distances and at lower altitude. The flight hours were nowhere near maximum and, although the cycles were high, the short flights often did not reach the maximum pressure differential, so the number of full pressurization cycles were considered to be significantly fewer than the 75,000 the aircraft should be able to handle. 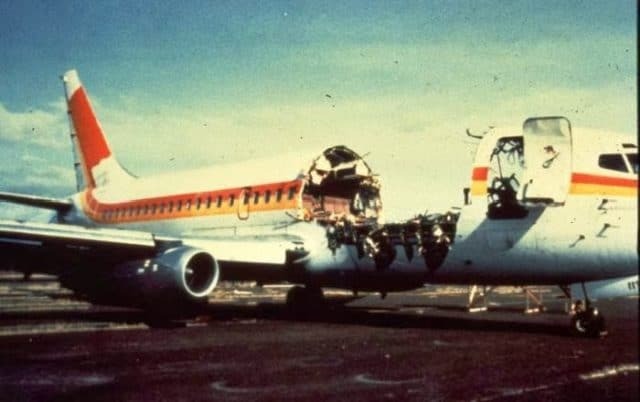 Aloha Airlines also pointed out that they were assured by Boeing personnel that the aircraft were still safe to operate. In fact, Boeing’s report with the recommendations were presented six months after the initial visits, clearly not giving the impression that they were urgent. Aloha Airlines felt confident that their aircraft were not suffering the same wear-and-tear as that of other operators and that there was plenty of time to get them upgraded. We now know that this was utterly wrong. The stress on their fuselage was not the altitude or the pressure but the cycles. An aircraft has three parameters: physical age, actual flight time, and how many times it has taken off and landed: cycles. Although the aircraft wasn’t reaching full pressure differential, the repeated pressurisation and depressurisation of the aircraft was causing high stress on the fuselage, much more so than the actual hours in flight. Also, Aloha Airline’s fleet flew exclusively around small Pacific islands, a humid climate and surrounded by salt water. The Hawaiian environment was much more corrosive than for the ‘average’ aircraft. 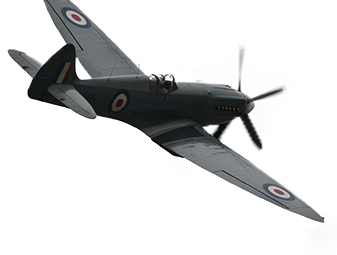 So at nineteen years old, the aircraft had suffered higher than normal levels of metal fatigue. Currently, all Boeing 737s with over 50,000 cycles must have their lap joints reinforced with external doublers. But at the time, it was not at all obvious that Aloha Airlines were leading the way for research into the metal fatigue characteristics of an aging Boeing 737. Only after this accident did it become clear that this was an accident just waiting to happen. On top of this, Aloha Airline’s maintenance procecdures were found to be faulty, ranging from badly trained staff to visual inspections being done at night. D-checks were started after an eight year interval and done in stages, so more than eight years had elapsed by the time the checks were finished, whereas Boeing stated D-checks must be completed every 6-8 years. This and other policies allowed a high number of flight cycles between structural inspections, allowing the corrosion and fatigue to accumulate. And then there was the equipment. According to the Boeing manual, the eddy current inspections done at Aloha Airlines’ maintenance facility was supposed to find cracks that were 0.04 inches or longer (that is, 1.016 millimetres). But in fact, the Boeing on-scene current eddy inpection done only identified cracks larger than 0.08 inches (2mm). As an example, where the post-crash inspection done on site had found only one crack, the NTSB laboratory found five cracks, all around 0.08 inches. After the accident, inspectors conducted visual inspections of the rest of Aloha Airlines B-737 fleet. They discovered ‘considerable evidence of corrosion on the fuselage as well as swelling and bulging of the skin, pulled and popped rivets and blistering and flaking paint along lap joints of almost every aircraft. There just isn’t the space to get into the problems here but you can get all the dirt in this scan of the final report. These things are all very worrying and a key question is where the FAA oversight of this operator was. However, the NTSB also concluded that if the maintenance program and procedures had been as expected, it might not have made a big difference: a high number of cracks and signs of corrosion would still not have been identified. No matter how well organized a corrosion detection and crack detection program may be and no matter how dedicated and vigilant the work force, the inspection process is inherently suspectible to some error rate. The root of the problem, then, was not aging fleets or faulty maintenance but that allowing the patching and inspection of ageing fleets was dangerous because the structural flaws accumulating were not easy to spot. Instead, operators needed to prioritise the removal and replacement of the stressed areas. Another issue that the NTSB brought up was the training of aircraft maintenance technicians. FAA approved training, they pointed out, was full of required studies that were largely irrelvant to the tasks that the maintenance personnel actually needed to achieve. FAA regulations required students to understand wood airframes, airframe fabric repair and the application of paint and lacquer, none of which are relevant in modern aircraft. The UK and other countries required in-depth training for Non-Destructive Inspection and other technology relevant to modern aircraft. But this was not required for mechanics studying in the US, where the curriculum made no reference at all to computers or composite materials. In 1988, it was possible, even likely, that a mechanic would be trained in wooden airframes and fabric repair and then be assigned to inspect Boeing 737s with very little training and out-of-date tools. But now I’m drifting away from the conclusions of the board. 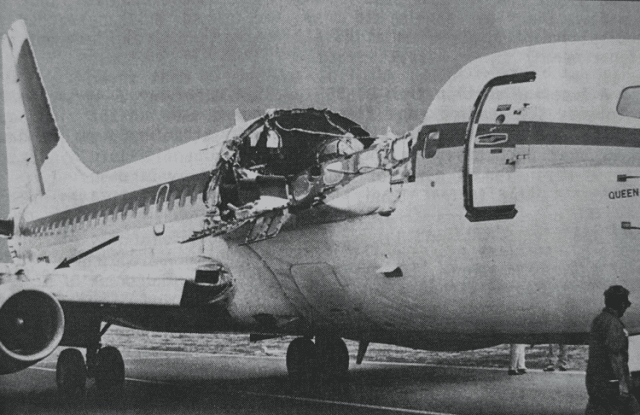 The National Transportation Safety Board determines that the probable cause of this accident was the failure of the Aloha Airlines maintenance program to detect the presence of significant disbonding and fatigue damage which ultimately led to failure of the lap joint at S-10L and the separation of the fuselage upper lobe. Contributing to the accident were the failure of Aloha Airlines management to supervise properly its maintenance force; the failure of the FAA to evaluate properly the Aloha Airlines maintenance program and to assess the airline’s inspection and quality control deficiencies; the failure of the FAA to require Airworthiness Directive 87-21-08 inspection of all lap joints proposed by Boeing Alert Service Bulletin SB 737-53A1039; and, the lack of a complete terminating action (neither generated by Boeing nor required by the FAA) after the discovery of early production difficulties in the B-737 cold bond lap joint which resulted in low bond durability, corrosion, and premature fatigue cracking. As a result of this accident, the FAA began the National Aging Aircraft Research Program, tightening inspection and maintenance requirements for high-use and high-cycle aircraft. The aircraft, valued at 5 million US dollars, was dismantled on site and sold for parts and scrap. There one more aspect to this one that I want to bring up: the NTSB’s final conclusion included one dissenting opinion. While I concur with most of the majority’s findings, I disagree with the probable cause and certain conclusions. Industry’s best engineers reviewed the carrier’s records, knew of its high-cycle operations, and even inspected some of Aloha’s fleet. No one—not Boeing, Aloha nor the FAA principal maintenance inspectors—recognized or predicted the critical nature of the multi-site cracking or that the aircraft hull was about to rupture. If a “failure” occurred, it was a system failure. He felt the probable cause of should have been much simpler, for example “the presence of undetected disbonding and fatigue cracking,” with the systems and programs at Aloha, the FAA and Boeing as contributing factors. I found this particularly interesting because I’d noticed that the concluding section of the report seemed a bit heavy handed when it came to spreading blame. The dissenter’s summary sounds much more like modern NTSB conclusions. So perhaps this report and the dissenting opinion also had an influence on aviation’s just culture for the results of aviation investigations. You can read a scanned copy of the full accident report here. As always, Sylvia has done an excellent job assessing the Aloha incident. Fortunately, it was not an accident (the only item in Sylvia’s article I feel I have to disagree with). Even if it led to the tragic death of a cabin crew member. The handling by the crew of the 737 after an engine exploded. The test pilots in the BAC 1-11 prototype who calmly transmitted what they encountered, right to the final moment when the aircraft they were testing got into a ‘deep stall’ and could not recover. It led to a new understanding of the consequences when a high-tailplane aircraft stalls and the tail gets into the disturbed air from the wings. It led to the development of the stick-shaker and -pusher. It also gave away the headstart of the BAC 1-11 to its direct rival, the DC9. And I suppose the incident in which Neil Williams during a routine (for him, anyway) aerobatic training session coped with a wing virtually detaching itself from a Zlin. He was not wearing a ‘chute and saved himself by rolling inverted, the wing came back in position and Neil flew inverted until near the ground, rolled the aircraft the right way up and only sustained light injuries. The Zlin Trener was a Czech-built all-metal aerobatic low wing two seater. Aerobatic aircraft are equipped with a g-meter. It has three pointers: one showing the actual g being pulled, the other two the maximum encountered, posiive and negative. They can be re-set to zero by a little push button, but the last pilot is supposed to leave the g-meter as is so that the next person can see for him or herself what positive or negative g has been the result of the previous session. It is not usual, but not unknown either for a pilot, after exceeding the g-limits, to zero the pointers and do a few manoeuvres within the limits, so that the last reading would suggest that no limits had been exceeded. Unscrupulous and very dangerous. This may have happened to the aircraft that nearly cost Neil Williams his life. The examples I mentioned demonstrate extremely competent air(wo)manship. The onset of metal fatigue still is difficult to determine, or it certainly was in the case of the Aloha incident, given the many variables that were not totally understood. A lot of progress has been made since the first Comets disintegrated in mid-air and no doubt this occurrence has added to the knowledge. The first jet I flew was an SN601 ‘Corvette’, built by Aerospatiale at St. Nazaire. We were trained there. One day we were shown a section in the factory where airframes were being subjected to continuous stress tests: One was a wing, a complete structure (minus the skin and tanks). The undercarriage was attached. This assembly was being tested, ’24/7′. The wingtips were held in clamps and continuously pulled ‘up’ and ‘down’ to, or maybe even a percentage beyond, the maximum design limits. I suppose representing severe turbulence, but in between these cycles the gear would be lowered, a ram would give the wheel a gold-almighty ‘bang’, the ram would withdraw, the gear raised and the wingtips bent to the maximum again, etc. At certain intervals the whole shebang would stop and the engineers would inspect the assembly for deformation, cracks and fatigue. In another hall was a sort of swimming pool with a submerged fuselage in it. This also would be pressurised and depressurised continuously, and again at intervals the fuselage would be inspected. The water would prevent an explosion, should the fuselage fail. The tests were to determine the maximum life, flight hours and cycles. Of course, the idea was that this testing would be ahead of any high-cycle aircraft in service and once the testing would stop, this would be used to determine the approved maximum life of the actual airframe. Only, in the case of the Aloha, the testing and the actual fatigue were out of step. I had not heard of the BAC 1-11 crash, and had to Google it. The British have not had the luck with their jet airliner development. I was thinking about that Daytona crash along with the Southwestern one when I decided to go ahead with this one. I’m interesting in understanding how things have changed when we have what seems to be clearly related issues. Interesting article, Sylvia. And thanks for sharing your comments, Rudy. 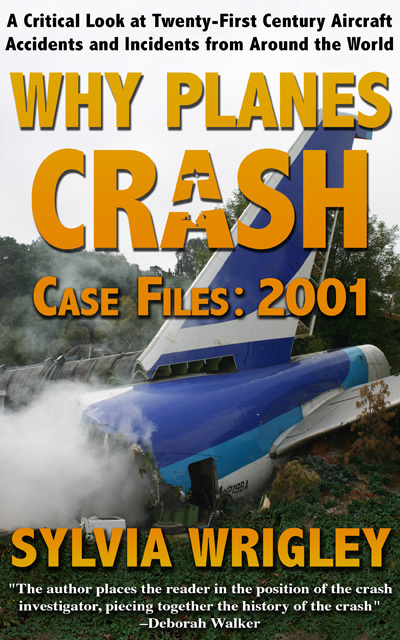 I’m an AMT with 43 years in the industry and although I remember the Aloha incident well, I never read about the BAC-111 accident nor Neil William’s incident. My first job in civilian aviation after 6 years in US Coast Guard aviation was with Fairchild Aircraft Corporation in San Antonio, TX. We built the SA226 and SA227 twin-engine turboprops for both corporate and commuter use. I worked the line in flight test and often rode right seat during flight testing of new production aircraft. We had an aircraft in a jig for fatigue testing as well. It was interesting to occasionally visit R and D to see where that was taking us. Service Bulletins were sometimes written for aircraft that were in service based on what was learned from that testing. After a new wing was developed for the SA227, it was put in a jig and loaded to the point of failure to verify computed G-loads. I wasn’t there for the test, but a buddy of mine that worked in R and D told me it sounded like a bomb went off when they reached the point of failure on the wing. I was torn between ‘accident’ and ‘incident’ but as there was one fatality and the aircraft was written off, I decided on accident. It definitely gets blurry at times, though. I remember this happening. A plane with a chunk of fuselage missing made all the rounds on the news. The report says the plane felt “springy” I’ve always wondered just how close it was to breakup like the Chinese aircraft. I’ve also wondered about the #1 FA who was sucked out and just how long she was conscious. One of those horribly unusual ways to die, like the guy down the road that had a sinkhole swallow him and his bedroom in the middle of the night. I had heard that this aircraft had previously owned by PWA airlines which used to fly Edmonton to Yellowknife, to Norman Wells to Inuvik and then back. I flew this route often and with short strips and continual weather concerns, and with no alternate airports, there used to be many times of abandoning a landing and circling for another attempt. And this more than often made for a landing that was hard. To sum up, those aircraft on that route where used hard. Surprised that the article mentioned nothing of past history and contribution to fatigue. I ran out of space. :) The aircraft’s history wasn’t considered to be a contributing factor in the accident report although if there’s a source for this, I’d be interested to read about it! I probably am looking a bit to far forward but I would wish to consider why the aircraft was able to stay in flight? Also what could/might be done for cabin crew safety, if anything! I don’t think you can really plan for a hull ripping off like that. Southwest flight 812 was only a couple of years ago and the cabin crew member injury there was because he didn’t put his oxygen mask on! Probably an exaggeration, but at the time it was rumoured that the strongest parts holding the front section and the cabin together were the seat rails. Surely, lessons have been learned about aircraft maintenance. My very first paid job as a pilot was banner towing, aerial advertising in Germany. The aircraft used for towing were Piper PA18 Super Cubs and an Aeronca Champion. We, pilots as well as the company, broke just about every rule in the book. The ultimate “cowboy operation”. We kept going, even in IMC. The maintenance chief (“Meister”) probably had ulcers as he had to compromise between his job and his conscience. The company had about 30 Pipers. Most were parked, tied down, outside during the winter and in spring were given a quick clean-up, an oil change and the tanks were drained. A run-up and good to go. Once in spring I had an engine failure after take-off. I was one of the few who stayed on during the winter. The cause turned out to have been water in the tanks. Yes, they had been drained but the PA18 is a taildragger. The fuel pick-up is just about an inch forward of the rear end of the tank. When the tail got up during takeoff the water that was still in the tanks could flow forward and was sucked into the system. The Super Cub had a collector tank behind the pilots’ seats so the run-up before take-off was still on the not yet contaminated fuel in the collector. I was at about 200 feet when the engine stopped. I called “mayday” but nobody answered. I landed in a field just beyond the airport. I opened a fire gate – it was not locked – put the tail on my shoulders, and pulled the aircraft back into the airport. At last a crew arrived, brought the aircraft into the hanger and drained the tanks again, this time with the tail raised on a support. Two milk bottles of water (nearly two liters) came out. The paint job of course was dull, weathered. We used to joke that the Cubs were not overhauled but merely “re-sprayed to zero time”. Once I was sent to another aerodrome and my Super Cub was cleaned and given a polish before I left. The chief was supervising the cleaning. I told him that the standards seemed to be dropping: “at least you used to re-spray them to zero hours, now you merely polish them back to zero time!” I had to run for my life. Yet, although there were many incidents, there were never any fatalities, not even injuries when I was there. Every pilot flew the same Cub, 6 days a week unless in maintenance. Mine was D-ELTD, then I got D-ELIH and later D-EFCY and D-EGGA. We knew exactly if there was something wrong with “our” Piper. Once, at an out-station there had been a severe thunderstorm overnight. It had caused a tear in the fabric of a wing. For this kind of eventuality we had been issued with a repair kit: a piece of fabric and glue. We stuck a patch over the tear. Only one little problem: the Einstein who had devised this procedure had pre-doped it. The Cub (and other fabric-covered aircraft) have a linen skin. (although other material is increasingly used now). It is a bit floppy when the aircraft is re-covered with new linen. Those of you who build model aircraft will know, it is the same: Cellulose dope is painted over the linen. This will make it shrink as well as water proof. The linen will be taut, ready for a new coat of paint. If it gets old, first indications are that if a finger is pushed at it, it does not return to its shape but will show a little dent. For proper assessment it should be tested with a tool that applies a certain local pressure. Linen in good condition will not be damaged, but if too old the tool will go right through. I often wondered whether these Pipers were actually still fit to fly. On another occasion I found a wingtip damaged in the morning. The Piper had a wooden arch in the tips. The wood had been weak for a long time and I had noticed a fold in the linen. But I was assured that the linen had just not been applied correctly. Yes, what we got away with then would not be possible to-day any more. I started there with a brand-new CPL, a year and a half later I left with more than 1800 hours in my log book. Yes: over a year an average of 100 flying hours a month ! During the winter we did not do much. During the summer more than 40 a week was normal. I don’t want to make excuses, not too many I hope. In those days (1969) there were virtually no jobs, airlines were not hiring. We took whatever work we could get. And got on with it – and (mostly) away with it. The Pipers could be landed “in yer granny’s back yard”. (One actually did, regularly, as we found out). And so the odd engine failure very rarely ended in tragedy. In fact, the outcome of most or nearly all incidents was comical rather than tragic. Flying passengers in high performance jets is a very different matter. The safety of the traveling public has absolute priority (or should have). One engine failure is normally a non-event. Nothing worse than a “sorry folks, we will be turning back. The company will have another aircraft ready for us and soon we will be on our way again”. A rapid loss of cabin pressure is a bit more dramatic, but even that is not a very difficult event to deal with. But Sylvia has discussed quite a few events that did not end well. Many were due to an unprofessional operation, poor crew coordination etc. For many years I was a member of the Tiger Club. On the panel in their aircraft they had a warning: “All aircraft bite fools”! Sorry if I diverted from the actual subject (again)..
Rudy, I’ve said this before but you really should write your memoirs. Not for personal glory or anything like that as I’m sure that wouldn’t concern you. You should do it because you have experienced the growth of the aviation industry over many years and in many different countries, so recording those experiences would be useful to aviation historians. You could also use your experiences to deliver important lessons to modern pilots about the causes of accidents and the psychology of flying, packaged in colourful anecdotes that make the reader more likely to remember them. I’m sure Sylvia would be willing to give you some advice on how to go about it. Although, I have the same problem with my aviation stories as with university work. I know, seem unable to stop when I should. I did my PPL in 1967, my CPL in 1969 and slowly worked my way to an IFR, a twin rating and eventually an ATPL. My flying days ended in 2008, that means 41 years flying, 22000 hours. And yes, aviation has changed a lot. We used to work out and file our own flight plan. Nowadays, certainly for a high performance twin, that is no longer an option. And a (private) jet now is either restricted to maximum FL 280, or must operate ‘RVSM’, unless able to climb straight to FL 430. RVSM operations require special equipment, RVSM rated crew and an RVSM operating permit. Especially in the case of a private or corporate operation, the paperwork for that is colossal, a manual must be submitted and approved. In some countries like the USA it is more straightforward. When I got checked out on the Corvette and the Citations it was a lot easier. We just filed for the cruising level and, unless interfering with other traffic, we could get it. The Citation I was able to climb to FL 410 but needed a ‘step’. Sometimes ATC wanted us out of the way because the ‘Slotation’ only did about 330 kts TAS. Before RVSM the minimum vertical separation was 4000 ft. If we were at FL 370 and ATC wanted us out of the way of a faster Boeing they usually told us to descend. That reduced the range – considerably. So we often could ask for FL 410 instead, and usually got it because the airliners rarely got up that high. Yes, aviation has changed and still is changing. What definitely has changed is the current onslaught of rules and regulations. Around the time when I took my first flying lessons (at EHHV) there still were a few die-hard owners of light aircraft who would on holidays fly all the way from Hilversum in the Netherland to the south of France without even a radio. Maybe Sylvia will lend me a hand? What I find remarkable about the flight 243 case is that the departing huge chunk of fuselage didn’t take the tail fin off! They were so lucky! I am an aviation enthusiast but I do not have a pilot license or a background in engineering just a curiosity in aviation. I was thinking that some of the blame should have been shouldered by structural engineers at Boeing. Surely they should have done due diligence, research, on stress factors in metal fatigue factors, flight cycles, environmental factors on aging fleets. I concur with the dissenting voice at NTSB. Of course we are looking at an accident/incident that occurred today some 31 years ago. A lot has been learned since then.